Last Friday, the 26th of October, we had a party to fundraise for the central heating system. About 150 people showed up and all together we raised about 2300 pesos. The outcome was great for Conviven, but we are still a few thousand pesos short, so if you want to help installing the central heating system before next winter, write to Madi (madi.lang at gmail dot com). Las week we started new classes in the villa – art, dance and theatre. All of them were very popular and we met a lot of new, happy and joyful kids. 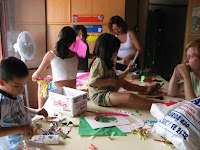 “We decided to start with a lot of games so that we could get to know the children and that they could get to know us. Of course at first we played a little name-game, where everybody sits in a circle and one stands in the middle. When the first name is shouted, the person in the middle has to touch the one who’s name was shouted, before he or she says another name, because then the one in the middle has to touch the person who’s name was shouted next. After getting to know each other we played a whole bunch of other games, their favourite appeared to be a more theatre related activity where everybody had to act out different things. We’re all looking forward to next class!" Next week we'll also start teaching English in the villa on Tuesdays and Thursdays, from 14.00-15.30. If you are interested in joining as a teacher, leave a comment or write to Liis (kangsepp at gmail dot com)! In September we were happy to announce that 10 year old Nahuel is going to Turkey to compete in an international chess championship. Now it has turned out that Nahuel has the opportunity to go, but his family cannot afford it. We are running short in time – Nahuel has to leave to Turkey in less than a month, but we are trying to get some funds together to help him get there. So if you are interested in helping Nahuel, please write ASAP to our volunteer Laura (laurajudith31 @ hotmail.com) who is in charge for this project. Usually so happy and bright Nahuel has been really sad lately and we suspect it might have something to do with the fact he cannot go to Turkey. He has been playing chess for five years now and is currently studying privately with a chess master. Let’s help him to be happy again! There is a lot going on at Conviven right now. I think the place has never ever seen so many volunteers at the same time – our team has 25 members right now and next week we’ll get two more people. You think it’s too much? Well, might seem that way, but since there is a lot to do, I am sure we are able to find something to do for everybody. Next week we’ll start classes in the villa – three times a week kids can come to learn art and participate in different workshops, such as theatre, dancing or music. Hopefully we can soon have classes every day soon. Our most advanced students – Group C – have a new activity where they write letters to their pen-pals every week. If you are interested in becoming a pay-pal, contact Lizzie (lizziemoran1 at yahoo dot com). The theatre workshop we started a few weeks ago is getting popular, as last week the teachers had more than 10 students attending. Next week, on the 26th of October we’ll have a party to fundraise more money for the central heating system. If you are interested in attending, leave a comment and I can share more information. In order to encourage the kids to write more in English we are about to start organising pen-pals (via the net) for each student in the Advanced afternoon English classes. Valmir suggested it would be great if our previous volunteers would agree to be the kids' pen-pal. Essentially this would involve sending a short email to your student each week focussing on a particular topic e.g. your family/hobbies etc in line with what they had learned in class that week. If you are interested, please get in contact with our volunteer Lizzie (lizziemoran1 at yahoo dot com) as soon as possible! This weekend, on Saturday 6th of October, four of our volunteers helped to collect food for those Argentineans that do not have a lot to eat. Banco de Alimentos had volunteers all over Argentina, handing out flayers and asking people in the supermarkets to donate some of the food the bought for poor children. Our volunteers Fiona from England, Lizzie from Australia, Benjamin from Denmark and Liis from Estonia were working for three hours in a supermarket called Carrefour, introducing Banco de Alimentos to people and collecting food. Free entrance, festival only takes place when it is not raining. Pictures from the last event are available here.